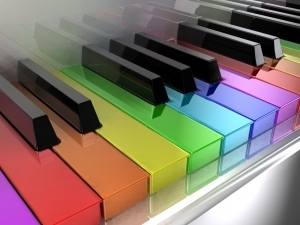 What if you could see the notes coming from a piano? What if every number you saw had a color, shape, and texture? What if each meal you ate was its own bouquet of colors? What if you could reduce every equation to a shape or sound? Perhaps it’s not as ridiculous as it sounds. There exists a condition known as synesthesia which causes some people to confuse two senses in various patterns, leaving them with very unique talents and frames of reference, but also allowing other incredible skills such as amazing memory. These people experience things that defy human expectations and perceptions of reality, experiencing multiple senses at a time in extraordinary combinations, and achieving incredible feats. But why? How is this possible? What does it mean? Synesthesia simply means combining senses. In other words, instead of merely seeing a color, a synesthete might actually hear and see it. Instead of merely hearing a symphony, a synesthete might actually taste and hear it. The prevalent theory as to why this occurs is that the neuron pathways in our brain can experience “cross-talk” if the inhibitions imposed upon these wirings are not in place to prevent this sort of mix-up. In other words, the pathways in our brain, though blocked in most people, can sometimes open up and allow cross-sensory interaction. Therefore, an accident, such as an impact to the head or a defect of some kind, is sometimes the precursor to this kind of condition. In fact, some have concluded that this can be replicated by drug-abusers, and that “existing connections become used in a way that’s neurochemically altered for a few hours” when this occurs1. So not only those with the condition of synesthesia can experience this, but theoretically anyone can. Synesthesia comes in various forms, but one of the most common forms is known as grapheme-color synesthesia, which simply means that individual symbols for numbers and letters of the alphabet, known as graphemes, are viewed by the synesthete as having color —and sometimes even texture, shape, or gender. Therefore, a grapheme-color synesthete might view the letter “G” as being tall and lanky, having the color blue, and being male—along with other possible attributes. Many other symptoms exist. Other forms of synesthesia include number-form synesthesia, which allows some to actually map out mathematical problems as shapes, and sound-color synesthesia, which causes the synesthete to not only hear a symphony, but to also experience an automatic light show accompanying it. Lexical-sustatory synesthesia is quite fascinating as it allows the synesthete to associate taste with spoken language so that words can literally leave a bad taste in your mouth. Any two senses can be paired together. This only expands the potential for enjoyment, as the person can now experience not one, but two dimensions of sensation simultaneously. In fact, some synesthetes look for not only good taste combinations when shopping for groceries, but also color combinations produced by these foods. This condition is very rare and some have estimated that no more than 100 synesthetes are alive today, though the numbers vary. However, if this is hardwired into every human brain, as researchers are beginning to conclude, perhaps this means we all have some perception of this “6th sense” on some level, remote as it may be. In fact, many of our idiomatic expressions suggest we have. Have you ever heard someone describe a color as “loud?” Or have you ever heard music or tonality described as “dark,” “light,” or even “round?” When it is extremely cold, we say it is “bitterly cold.” We often use phrases that reflect a combination or “crossover” of two senses. Haven’t you ever tasted food that had a “sharp” flavor? “Sharp” is a feel word, while “flavor” is a taste word. We reflect in our language and expressions that we do have some ability to sense in multiple dimensions. And the list goes on. Jonah Lehrer sought out to find the cause behind this. His research found that these sensory connections are based on conceptual contexts. For example, one subject, when trying to recall the word “Castanets,” before she had actually found her word, experienced “Tasting tuna fish as she grappled for the word. "4 It was later “confirmed that these were the tastes [she] normally associated” with this word. Indeed, it seems something exists in man that could be the residue of a system of perception far superior to, more advanced, and more complex than anything we’re accustomed to today. Some have concluded that perhaps these amazing phenomena just might be a peek into what is in store for the saint in his glorified body. Scripture tells us that “Eye hath not seen, nor ear heard, neither hath entered into the heart of man, the things which God hath prepared for them that love him” (I Corinthians 2:9). Imagine the glory of heaven if we could enjoy the entire electromagnetic spectrum, seeing sounds, and tasting colors. What if we could memorize every piece of information with the ease of a computer by combining color, sound, taste, feel, and sight in so doing? But hold on just a minute. If these things are built into the bodies God has already given us, could it be we have stumbled onto something that was once available to us, but is now covered by the cursed condition of the earth? Perhaps the Garden of Eden was much more than we can even imagine. If Daniel Tammet could memorize pi to over 22,000 decimal places, learn a new language every week, and memorize hundreds of books, just because he could access something most people can’t that is nonetheless hardwired into every human being, maybe it wouldn’t have been that hard for Adam to get married and name all the animals in the world in one day after all. And God saw everything that he had made, and, behold, it was very good (Genesis 1:31). 1. Carpenter, Siri. “Everyday fantasia: The world of Synesthesia.” Monitor on Psychology, Volume 32, No. 3 March 2001. Available at: http://apa.org/monitor/mar01/synesthesia.html. 2. Cooper, Rebecca. “Simple Brilliance: Daniel Tammet’s ‘Born on a Blue Day.’” Harvard Brain, Volume 14, May 2007. Available at: http://www.hcs.harvard.edu/~hsmbb/harvard_brain2007.pdf. 3. Duffy, Patricia L. Blue Cats and Chartreuse Kittens. Holt Paperbacks (November 1, 2002). 4. Lehrer, Jonah. “Blue Monday, Green Thursday.” New Scientist May 19, 2007. LexisNexis Academic. Retrieved March 26, 2008.